In celebration of our 20 year anniversary, we’re sharing 20 of our favorite things -- from tools to travel destinations and everything in between. This month we highlight 20 of Skyline's most requested and unique finishes that guarantee the "wow-factor" in any office space. These bulbs are the trendiest thing since kale salad. these strands can class up any space. we are digging the come back of bold, vibrant colors. Eye catching, affordable, effective--what's not to love? 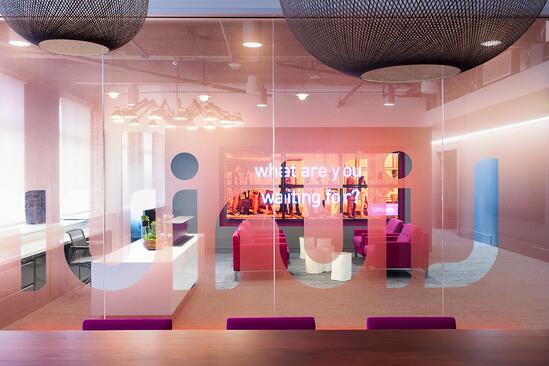 to add a hint of privacy, while tying design elements into the overall brand. 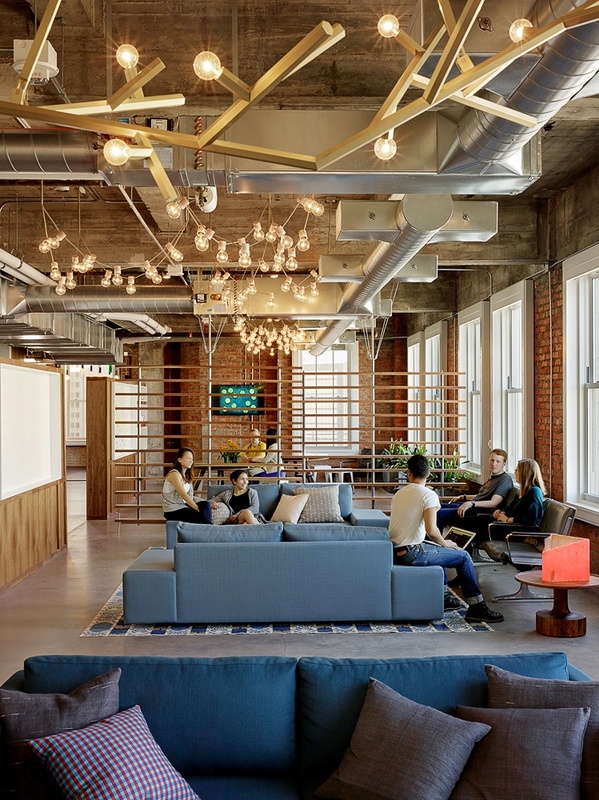 industrial feel and we are seeing this look come to life all over the Bay Area. The reclaimed wood trend is everywhere. No doubt you've seen it before. 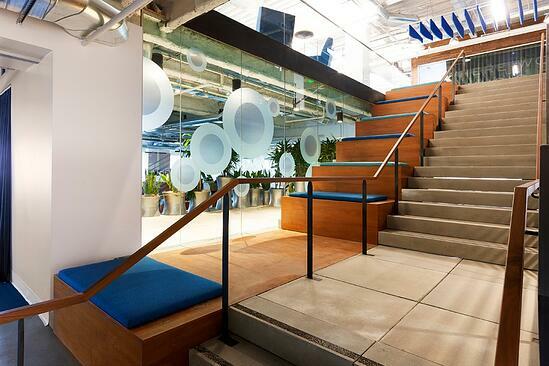 But its beauty is in its versatility -- it suits a funky tech space just as well as a sophisticated VC firm. Rolling barn wood doors, reclaimed wood walls and live edge tables are trends we see time and time again. Channel your inner child and scribble on the walls? Yes please. 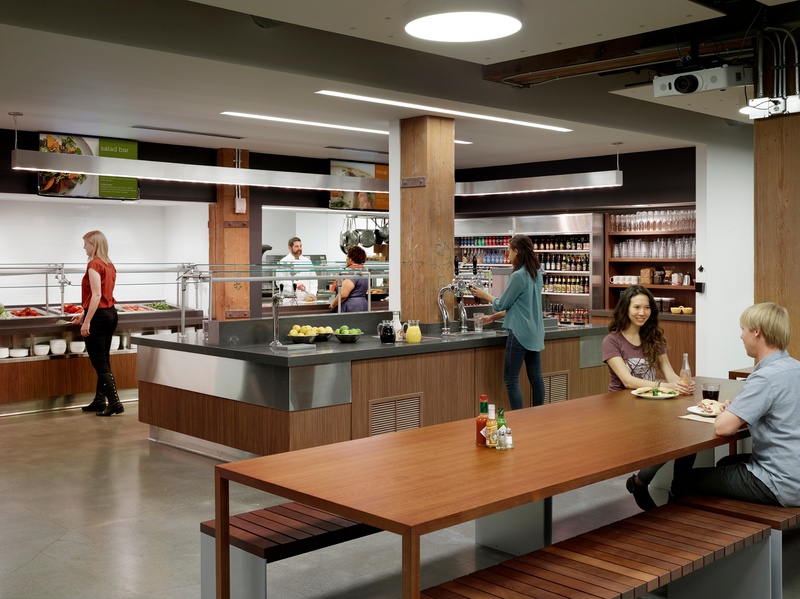 transforming the space into a hub of creativity and collaboration.... especially loved by our tech clients. 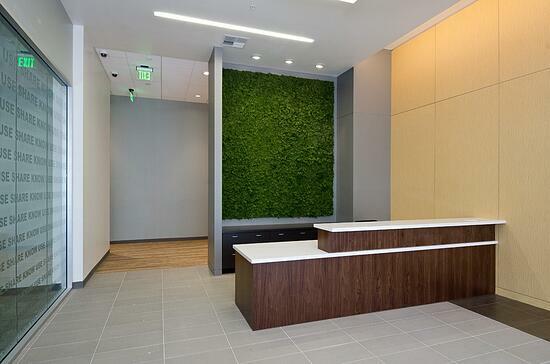 Living walls make a dramatic statement in any space. to reduce stress, enhance indoor air quality, and improve mental health. Two thumbs up. We're convinced there is no better way to get from point A to point B. We geek out over slides and love the challenge of their technical installation. Traditional frames are being replaced with custom installations commissioned by local artists. 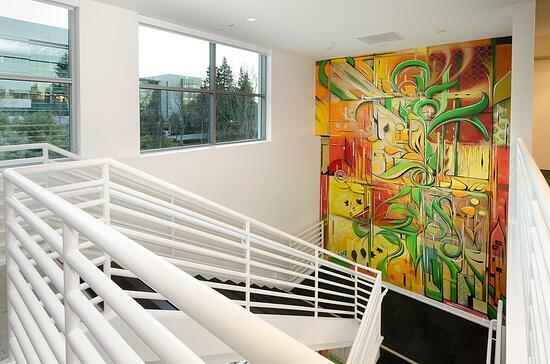 See the graffiti wall below... double whammy to capture a company's culture and support local artists. The popularity of exposed ceilings was quickly followed by the necessity for ceiling clouds. 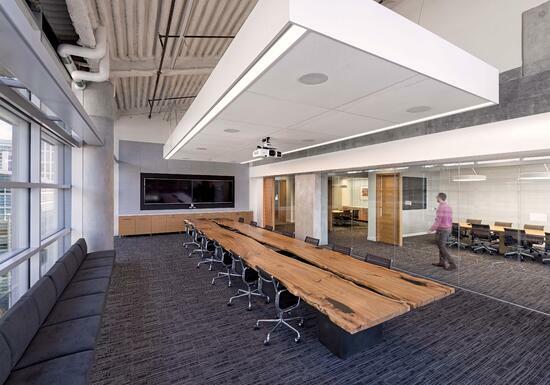 These installations lower noise levels and distortion while enhancing acoustics. especially when the staircase doubles as a lounge area or incorporates a slide. 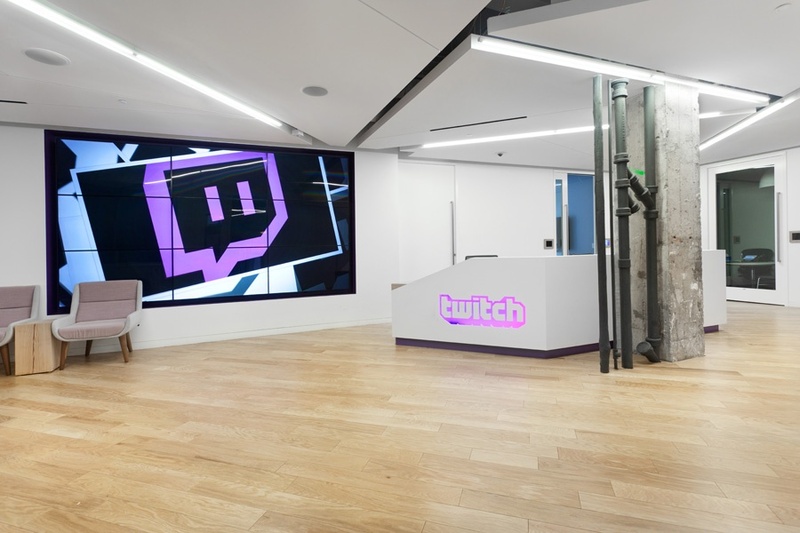 we're starting to get a little jealous of the our client's #workperks. 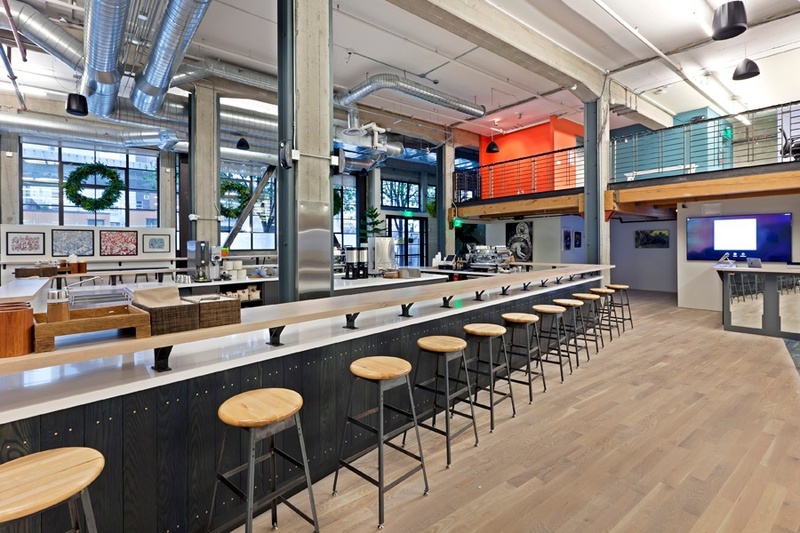 Who doesn't love a hot free meal, a specially designed wine fridge or multiple kegerators? 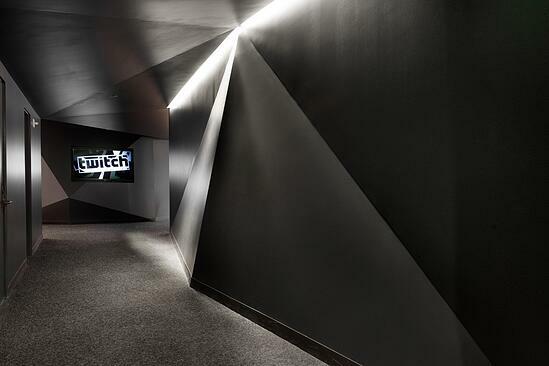 Possibly one of the funkiest features trending, but the walls really are in fact scratch and sniff. 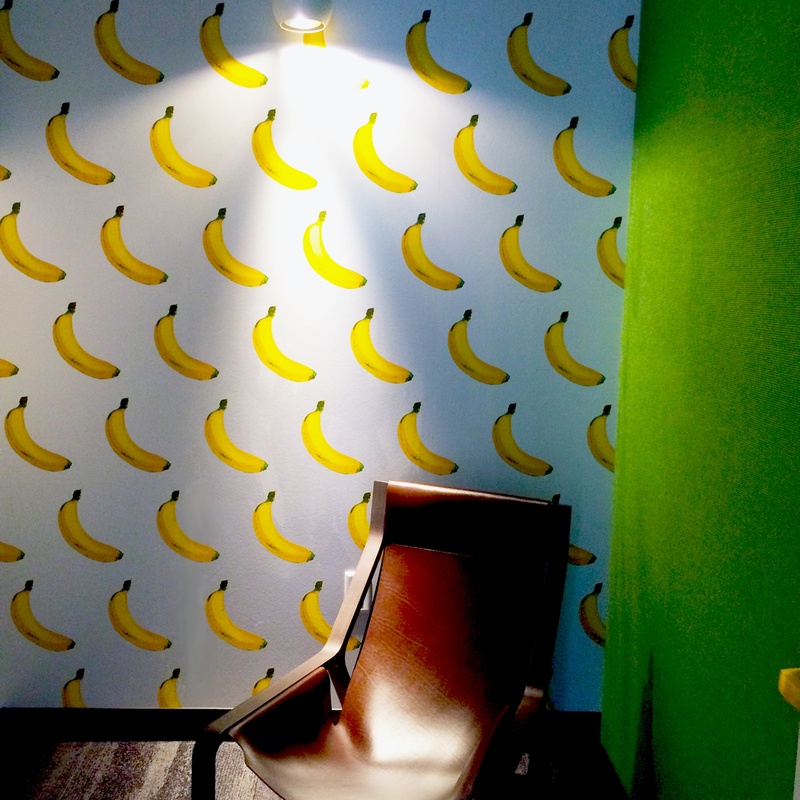 Hope bananas are your jam if you reserve this phone room for your next conference call. 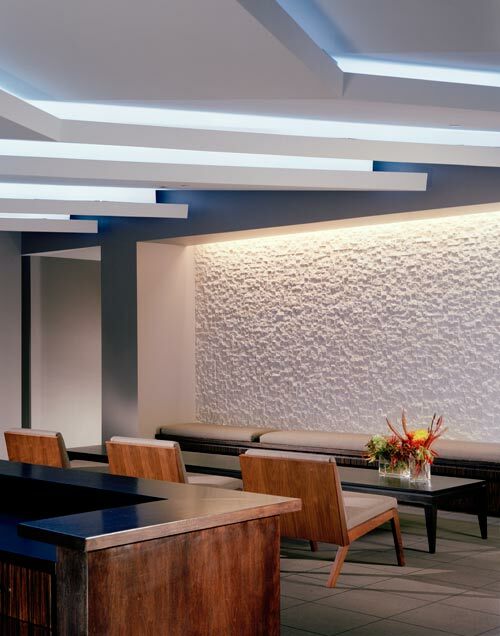 interactive content and strong messaging in any Executive Briefing Center or lobby. but in the evening they double as the meeting place to enter a hidden retro bar. Who needs drywall when you can trick out your walls and ceilings with custom mill work. 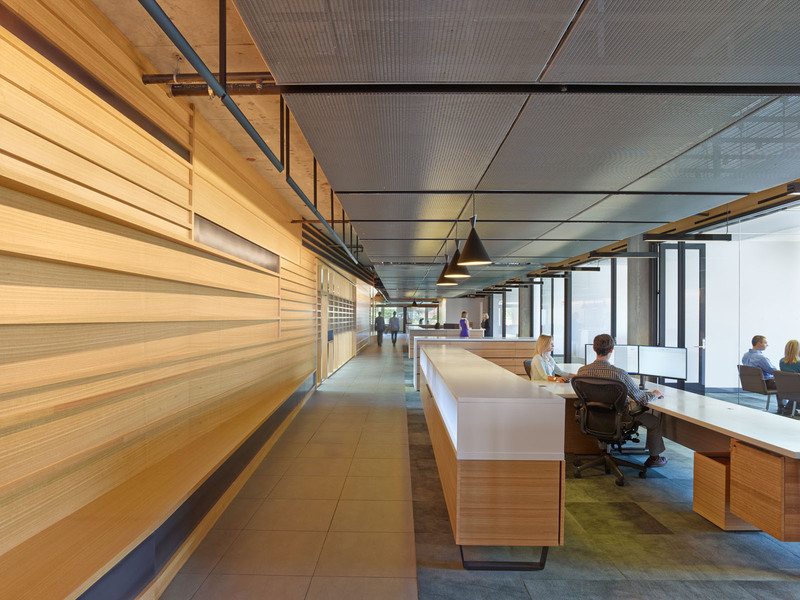 Luxurious spaces are using wood as a distinguishing feature in their design. Just gorgeous. 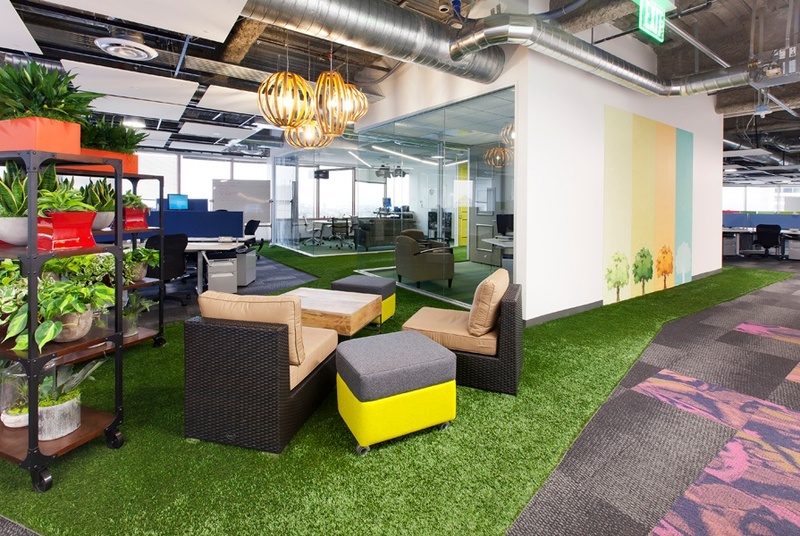 Grass in the office? Why not? 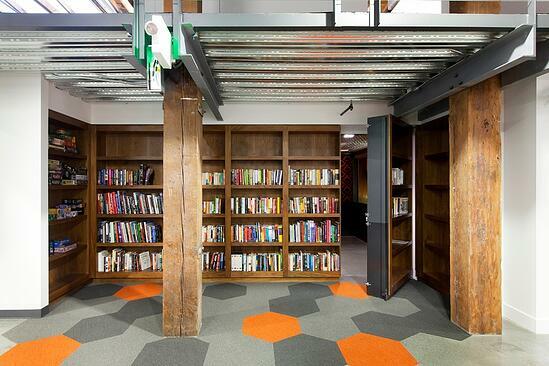 Non-traditional flooring is an easy way to make a statement and show separation of spaces. for lighting and sound. The office below designed their ceiling to look like airplane wings. We approve. 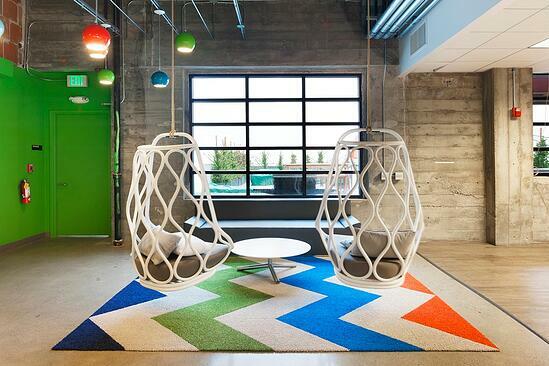 In our opinion, swinging in these suspended chairs would be the perfect way to clear writers block. 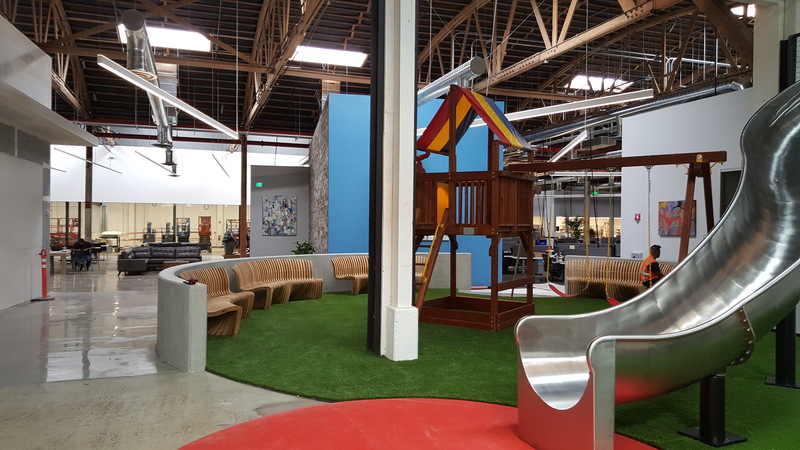 Love that firms are adopting swinging chairs, hammocks and all kinds of alternative seating. Out with the boring straight hallways, in with these tricky, asymmetrical wall panels.